Thoughts from a Buttonmonger: Galvin Manufacturing Corp.
Motorola started in Chicago, Illinois as Galvin Manufacturing Corporation (at 847 West Harrison Street) in 1928, with its first product being a battery eliminator. In 1930 Galvin Manufacturing Corporation introduced the Motorola radio, one of the first commercially successful car radios. 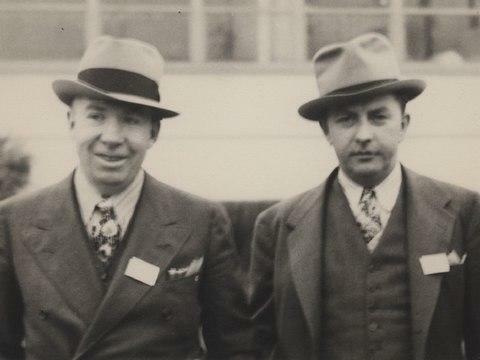 Company founders Paul V. Galvin and Joseph Galvin created the brand name Motorola for the car radio - linking "motor" (for motorcar) with "ola" (which implied sound). Thus the Motorola brand was meant to indicate "sound in motion." The name "Motorola" was adopted in 1930, and the word has been used as a trademark since the 1930s.